ON Monday morning, The Boy did not want to go to school. He did not what to go to school so much that after going to school and running around for five minutes, when the bell rang and the doors opened, he set off back towards the school gate. 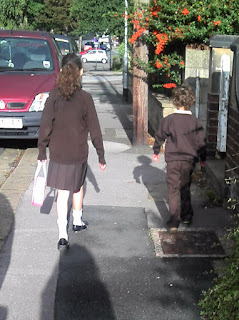 "Where are you going," I followed him in the I'm-not-running-after-my-escaping-son-at-all-everything's-fine manner one must employ when in the presence of other school mothers (a voracious breed inclined to cluck and tut at the slightest provocation). By the time I caught up with him he was stomping off around the corner. "I'm going home," he announced. We were, though, very on time for school. After being woken on Tuesday morning, he flung himself headlong across the sofa and proceeded to relax with a fair amount of determination. "Breakfast and school," I chimed as brightly as one can chime first thing in the morning. Probably more of a clang to be honest. Boy rolled his eyes: "I did that yesterday," he said and continued his relaxing which was definitely edging towards full-on lolling. "But you have to go again today," I pointed out. Clearly, this was not good news. Roused from the sofa, he crossed his arms: "I'm not going to school." Things continued along this vein for a while. The clock ticking, his sister tutting. "But you went every day last year, you know how it works" I said (or rather pleaded on bended knee while trying to thrust various of his limbs into various parts of uniform). "But I did that," said The Boy stubbornly, "I don't want to do it again." We were very nearly late for school. The Boy discovers 706 things he would rather be doing than going to school. He complains his pants don't fit, that his sock has a hole in it (it doesn't). He puts his shoes on the wrong feet. Then decides he needs to go to the bathroom much more urgently than he needs to go to school. Not once does he say "I don't want to go to school." We are very quite late to school. I am very relieved. Normal service is resumed.